Load balanced, robotic arm featuring all aluminum construction and the only fully expandable "smart grip" design components. Feature for feature, the series presents the most powerful and sophisticated, all aluminum robotic arm system available today. All parts are precision CNC machined from 0.063 gauge 5052 brushed, sheet aluminum The aluminum components are anodized to a smooth, scratch resistant, graphite finish using a type II anodizing process. 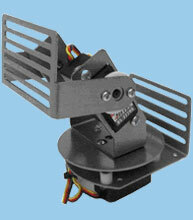 All servo pivot points use integrated pem stud pivot points. Integrated pem nuts for ease of construction. This makes construction much easier and faster. Pass thru holes and slots strategically located throughout the arm assembly for convenient wire routing. Two integrated SPST switches for convenient power routing to servos and supporting electronics. Three integrated mounting tabs for convenient attachment to your robotic platform The arm incorporates a custom engineered, counterbalanced retract system that effectively ensures maximum lifting and efficient servo power use both during operation and at rest. A counter balanced arm is critical to ensure long servo life and maximum lifting power. The most critical aspect of any robotic arm is in the design of the manipulator or gripper. A robotic arms usefulness and functionality is directly related to the arms ability to sense and successfully manipulate its immediate environment. The gripper contains integrated slots to accommodate multiple sensing opto-electronics components. The ends of the gripper are rounded for an even gripping surface area regardless of the gripper angle relative to the object being grasped. The gripper drive system consists of a high resolution, 60 tooth, heavy duty, resin gear train driven by a high torque servo - All of these combined components are critical for firm, precise gripper manipulation of objects. The rounded gripper ends can conveniently accommodate the pressure sensor for precise gripper pressure measurement and control. Cross-linked polyethylene foam is used to line the inside of the gripper surface for maximum grip adhesion. Maximum lift capability : 400.00g or higher (depending upon configuration). A Six Legged Robot with the highest quality and value in mind for the serious roboticist. If you think this robot is amazing just by the photographs, just wait until you see the smooth and fluid movements of the Hexcrawler. The HexCrawler's large size and generous number of expansion slots can accommodate a considerable amount of additional electronics and hardware upgrades. The HexCrawler Kit is designed to be a walking platform for you to customize and expand to your specific vision. With a payload capacity of over 7.5 pounds, no other hexapod kit can even come close to the rugged design, payload capacity and expandability of the HexCrawler. Sensor Scanning System can be used to overcome the limitations of "fixed" sensors. 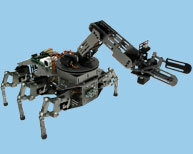 With additional accessories, the HexCrawler robot may be programmed to perform all sorts of neat movements. The detailed manual gets you started with a number of complete programs. Once you have mastered the supplied code, you can easily customize it using your own programming creativity. Super stiff yet light construction material : All aluminum components are precision CNC machined from incredibly strong .063 gauge 5052 aluminum sheeting. Integrated Pem Stud Pivot Points : These spacers are used as the servo pivot points for all of the HexCrawlers legs. The combination of these spacers and the solid design and aluminum components are what gives the HexCrawler it's overall rugged design and payload capacity and Integrated Pem Nuts. Horizontally Centered Leg Design : To ensure equal, physical, horizontal movement of all legs during the HexCrawlers walking cycle, the legs have been physically designed to align with the horizontal leg servos. Pass Through Leg Design : Having the ability to expand and add lots of additional electronics and sensors to your hexapod is a key component of robotic experimentation and development. The HexCrawlers "pass-thru" leg design allows you to route and secure electronics at any point on the legs of the HexCrawler without wire or electronic components being exposed or interfering with the operation of the HexCrawler. Expandability : Being the largest and lightest hexapod available, the HexCrawler has ample room to accommodate a multitude of additional sensors and hardware add-ons. Multiple expansion slots and holes have been strategically placed on both "decks" of the HexCrawler as well as the front and rear support brackets for the addition of hardware and electronics. Adjustability : Unlike hexapods made from heavy, non-adjustable, plastics and other materials, the HexCrawler's legs are fully adjustable. Each leg offers 2 fulcrum points to choose from in the event your HexCrawler needs to carry extra heavy loads. Dimensions : Overall dimensions - 19.56" X 15.75" (49.68cm X 40.00cm) leg to leg. Prototyping Space : 282 sq. inches (1819.35 sq. cm) of total prototyping space is available on the HexCrawler body. With it's generous sensor mounting area, multiple sensors can be mounted easily and quickly. To ensure full panning clearance, an internal servo mount design was implemented to allow it to pan a full 180+ degrees. Ultrasonic Sensors, Infrared Sensors, Mini CCD Cameras etc can be easily mounted. The tiltpan was designed with a forward lean of 40 degrees to allow it to tilt a full 180 degrees straight up and down without the assembly being in the field of view. To ensure rock stable operation, 4 stabilizer pads support the panning assembly during operation. 2 servos with heavy duty resin gears ensure long, rugged, hassle free operation.